We’d love your help. 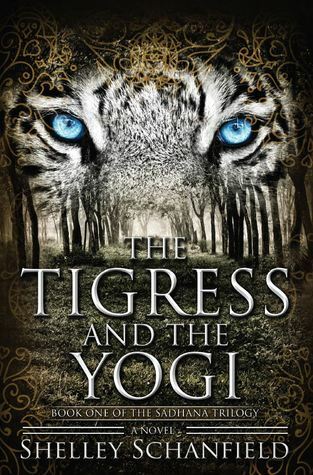 Let us know what’s wrong with this preview of The Tigress and the Yogi by Shelley Schanfield. A talking tigress. A wandering yogi. A young woman’s journey through an ancient land where chaos threatens gods and mortals alike. A tigress speaks to the outcaste girl Mala, and she flees in terror only to collide with an old yogi. She offers him shelter, and in return he spins wondrous tales and awakens her hunger for forbidden spiritual knowledge. Thus begins her quest fo A talking tigress. A wandering yogi. A young woman’s journey through an ancient land where chaos threatens gods and mortals alike. To ask other readers questions about The Tigress and the Yogi, please sign up. I received a copy of this book from the author in exchange for an honest review. Despite a fascinating premise and a strong start, I quickly lost interest in The Tigress and the Yogi. I rarely DNF books but I found the pace so agonizingly slow that I was unable to finish it. Perhaps others will have more luck. The first in a trilogy. Can hardly wait for the next one! This is a gripping story of a young woman who overcomes adversity only to face it again and again. Mala is presented as young, innocent and sympathetic, and then, over the course of her life's journey, we see her harden and begin to take revenge on the world that has attacked her. The characters are well drawn and the plot is very compelling. You also learn a lot about the time period and the cultural background of Buddhism. I literally couldn't put this book down! I recommend it highly! The cover is completely wrong for this book. I picked it up thinking I would be reading a fantasy book. More high fantasy than urban. Instead, it's a very well written literary fiction that is somewhat historical. It's the first book in a trilogy and the story begins with the lead up to Prince Siddhartha's transformation into the Buddha. It's near lyrical at points as we follow the life path of a little casteless girl named Mala. Her family is at the bottom of the caste system as the unofficial 5 The cover is completely wrong for this book. I picked it up thinking I would be reading a fantasy book. More high fantasy than urban. It's near lyrical at points as we follow the life path of a little casteless girl named Mala. Her family is at the bottom of the caste system as the unofficial 5th caste, the casteless. And among them, the very worst jobs that increase the severity of their "untouchable status" are tanners and chandlers. Mala's father is a tanner. Mala is different. It's not very obvious at first til one day she meets a white tiger cub in the forest. She realizes her danger as the mother must be nearby and sure enough, she shows up sending Mala into a deep fright that her death is immediately coming. Instead, there's a voice in her mind. It's the mother tiger! Mala will not be harmed and can go home safely. She runs but then comes across a dirty traveler who asks if she has food. It is the duty of a good Hindu to honor such requests so Mala invites the traveler back to her home even though her family has barely enough food for themselves. He turns out to be a yogi named Asita. As the story progresses, we learn that Asita is one of the genuine wise yogi. They are the ones who have mastered many of the enlightenment aspects of Hinduism, and do not abuse them for their own purposes. This is the beginning of what makes this story a solid 5 stars for me. We begin learning alongside of Mala via Asita, the higher aspects of Hinduism. About how the gods are various aspects of Devi, their god. The mythology between the aspects and how they came to be. Soon after that, Mala is returning home from the forest when a different voice speaks in her head. A voice cautioning her to stay a moment as she's about to step clear of the forest. She pauses, and finds herself witnessing the murder of her parents. As she is hidden, the wicked men leave, satisfied that they've achieved their main goal. It's not a random assault. Her childhood is now ended and she must find a way to survive. And thus begins the real story. If you are unfamiliar with Hinduism as I was, through Mala and later others, you will learn a great deal about it. The author takes great literary license with the back story of the birth of Buddhism and weaves an engaging story. But is it fantasy? Or magical realism? Or are the seemingly supernatural aspects experienced by the characters a real thing? Returning to my opener, the cover is simply wrong. It promises a very different kind of book and I feel it does an injustice as this book must be given more care in reading to truly immerse the reader. I highly recommend this book to all readers. If a reader is not disposed to thinking of Hinduism as a real religion, it will still be a good story. It belongs among the "best books of 2016", and will certainly go on that shelf for me. I'm adding Shelley Schanfield to my list of authors to watch. I hope the next book will not be a long wait! Thank you Shelley for providing a free copy via Netgalley in exchange for an honest review. You've found a new fan! I thought this book was well-written, very smooth, and easy to read story that took me to a magical place. The synopsis grabbed me even though the cover loses me. This story starts out great; pulling you in at the beginning and making you want to keep turning those pages for more. However, it did slow down a bit here and there for me which made me feel like I had to trudge slowly through the muddy boring slow parts. I did like that beginning story was more a contextual premise for the actual sto I thought this book was well-written, very smooth, and easy to read story that took me to a magical place. The synopsis grabbed me even though the cover loses me. This story starts out great; pulling you in at the beginning and making you want to keep turning those pages for more. However, it did slow down a bit here and there for me which made me feel like I had to trudge slowly through the muddy boring slow parts. I did like that beginning story was more a contextual premise for the actual story; when Mala has to find a way to survive. This was a bit out of my comfort zone, a very different read for me. Mala is the daughter of a tanner – an outcaste girl who knows she is less-than. However, she also has a secret – the gods have spoken to her. In fact, they kept her safe as her father was killed, then when her mother was raped and murdered. As life does, hers follows a twisty path, from the young girl who was too afraid to name her mother’s killer, to a brutal killer herself…and then beyond. Woven throughout the story of Mara is that of Siddhartha, the Sakyan prince who would one day become the Mala is the daughter of a tanner – an outcaste girl who knows she is less-than. However, she also has a secret – the gods have spoken to her. In fact, they kept her safe as her father was killed, then when her mother was raped and murdered. As life does, hers follows a twisty path, from the young girl who was too afraid to name her mother’s killer, to a brutal killer herself…and then beyond. Woven throughout the story of Mara is that of Siddhartha, the Sakyan prince who would one day become the Buddha. It has been awhile since I've been very engrossed in a story. This one mixes Buddhism, Indian's Mythology and you eagerly turn the pages to know what will happen next. I've really enjoyed Mala's tale even if her path is not an easy one. She has overcome a lot of pain and suffering, tried a lot of roads to be able to let go of her anger and revenche desire. As for Kirsa, I can't wait to learn what the author has for her in store. I'm sure I will have to keep the kleenex nearby! Well written and entertaining, I've really spent a great time with this book. The imagery of the book is what first pulled me into the story. I personally got a bit lost and confused with a few plot points in the story and for me the main characters got lost a few times in my shock over a few of the extreme scenes. Overall I personally rate this book a 5/10. I wasn't really sure how much I would like this book because I don't know anything about the Buddhist culture. I actually ended up likeing it quite a bit. It really pulls you into the story and makes you feel like you are there with the characters. I had a hard time finding a good spot to put it down, so I just kept reading. I will definatly be looking for more books by this author! I was truly fascinated by this story about a peasant girl named Mala who eventually grows up to be a bloodthirsty warrior queen. But through forgiveness and right action she learns how to transform herself back. Charming! Beautifully written. Definitely transports you into the time. However, to be honest, at times I had found myself a bit mired down and had to push through, while still appreciating both the story and the talent of the author. Great characters. Looking forward to the next book to see what's in store for Mala. Very good read. Took me to a magical place where I got lost in the book. Excellent! !